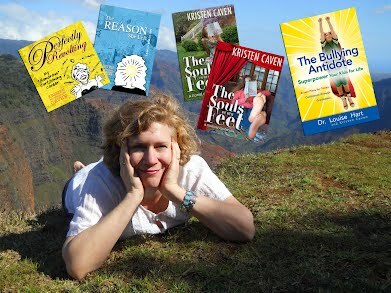 An innovator who works creatively in all available media, Kristen Caven is an action-oriented changemaker who guides energy through voice, character, relationship. intellect and emotion. Generous Muse represents her creative and collaborative outpouring. Kristen Baumgardner Caven’s creative career began in high school where she illustrated books, designed t-shirts, and produced films and plays. She was a cartoonist in college, began dancing and modeling in her twenties, wrote screenplays and musicals in her thirties, and novels in her forties, when she also began speaking and teaching. She had her first art gallery showing at age 21, toured as a dancer, and is known for her creative pranks. Approaching challenges creatively, she blogs profusely and writes articles about parenting, psychology, health, humor, social philosophy and creative fulfillment. Her lyrics, poetry, short stories, plays and songs often feature comically layered characters with a feminist perspective. 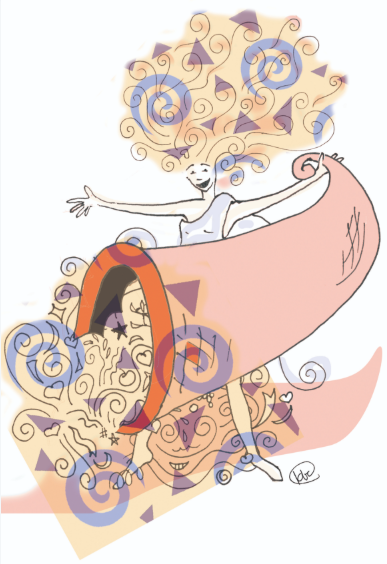 Kristen’s offerings, from graphic novels to greeting cards to books on various topics, all aim to illuminate, enlighten, inspire, and amuse. Read more about her literary awards and publications here. Starting her education at a Great Books school and finishing at a Women’s College, Kristen studied at various Art schools and holds a certificate in Applied Positive Psychology from The Flourishing Center. As a lifelong associate of parenting thought leader Dr. Louise Hart, she understands how the child mind underlies even the most sophisticated expression. Using conversation to build community, Kristen educates and facilitates on a diversity of topics, listening to her audience and seeking Promethean insight. Her weekly dance classes, workshops, playshops and special events allow participants to join in expressing themselves freely and joyously. Kristen is the founder of three publishing companies. Lifeskills Press (now closed) and Uplift Press both “rescued” several crucial books from obscurity and brought forth others into higher platforms. Little Pig Productions began as a joke with her creative husband based on his famous cartoon pig, evolved into a personal blog about their family life, and is now an outlet for art stuff. She has also been an agent of Spiraling Music since 1996. Because we achieve more together, Kristen Caven’s secret Swabian superpower is in building and re-shaping organizations. As a design, marketing, and business consultant she has helped artists, musicians, and entrepreneurs make their presence felt as Cowgirl Creative; as a nonprofit leader and structural repair specialist she has helped stabilize numerous organizations for endurance and longevity. Kristen is serving or has served on the boards of Peter Pan Cooperative Nursery School, Friends of Sequoia School, Bret Harte PTSA, Oakland Tech PTSA, The Heart of the Muse, Child-Friendly Initiative, and Oakland Parents Together. As director of The Zorgos Project she gave 3000 parenting books to Oaklanders. She is currently president of the Berkeley Branch of the California Writers Club. But how do you pronounce her name? The poster makes a great gift for your dentist, massage therapist, or gynecologist.